For newborn and tender young babies, this unique pillow conforms to head shape, allows air circulation and helps prevent flat head syndrome. The Omved Baby Mustard Pillow prevents flat head syndrome (Plagiocephaly) by evenly distributing pressure around baby's delicate head whilst offering comfort to the baby. Mustard seeds have been used traditionally to help increase blood circulation, reduce ear infections, calm colic and soothe the sinuses. They are a constant source of bio-energy. The baby will wake up rested, full of vitality and less prone to illnesses. A baby's skull takes approx 12 to 18 months to harden. During this time it is important to protect the baby's head from any repeated pressure building up on one area of the head that can lead to flattening. Vedic traditions used mustard bags to support the child's head. 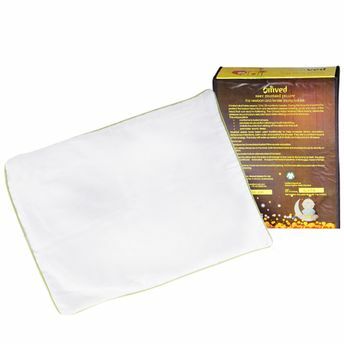 This unique pillow has been created specially for newborn and young babies to help prevent and effectively treat flat head syndrome. This is a common medical condition also known as Plagiocephaly, Brachycephaly or Scaphocephaly.